Government Backs Up On Rearview Car Cameras Regulators were about to announce that as of 2014 all new cars would have to include rearview cameras so drivers could see what's directly behind them. Then they delayed the rule. Safety advocates say the auto industry is stalling; carmakers see the proposal as government overreach. A camera is used instead of a rearview mirror on the Toyota NS4 plug-in hybrid concept car at the North American International Auto Show in Detroit on Jan. 10. The statistics are pretty grim — on average 300 people a year die after being hit by cars backing up, according to the U.S. Department of Transportation. Half of them are children younger than 5. A group called KidsAndCars.org posts photos of the children killed by backup accidents. They also produce public service announcements warning of the dangers. Yet federal efforts to prevent the accidents are part of a continuing debate over the costs and benefits of regulations. In 2008, Congress approved a law to establish rear visibility standards. Safety advocates were hoping that after two delays, the government would finally force automakers to comply by installing backup cameras on all their vehicles. But this week, Transportation Secretary Ray LaHood again delayed the regulation, stating in a letter to lawmakers that "further research and data analysis is important to ensure the most protective and efficient rule possible." The auto industry said it did not seek the delay. Still, Wade Newton, a spokesman for the Alliance of Automobile Manufacturers, the industry's Washington lobby, says it wants the government to consider alternatives to backup cameras. In this PSA, KidsAndCars.org says a blind spot on a large SUV can block up to 62 children from the driver's view. "Our feeling is we'd urge the government to explore all the options out there, including mirrors, that can help expand the field of vision behind a vehicle, because there really are a variety of tools that can be used," Newton said. Janette Fennell, president and founder of KidsAndCars.org, is skeptical that car buyers are going to want to opt for the mirrors. "What they're talking about are the type of mirrors that you see on a postal truck or on a school bus," she said. "I mean, these are very huge mirrors, and that's the only thing that would give you full visibility of what's behind your vehicle. "I don't think the motoring public is going to want to do that." Joan Claybrook, a longtime advocate for tougher auto safety standards, says the industry is stalling as it has in the past. "When air bags were first being considered, the manufacturers said people hate air bags, and ... I was in the Department of Transportation then," she said. "We did all these studies and research. And people love airbags, and they'd love backup cameras." 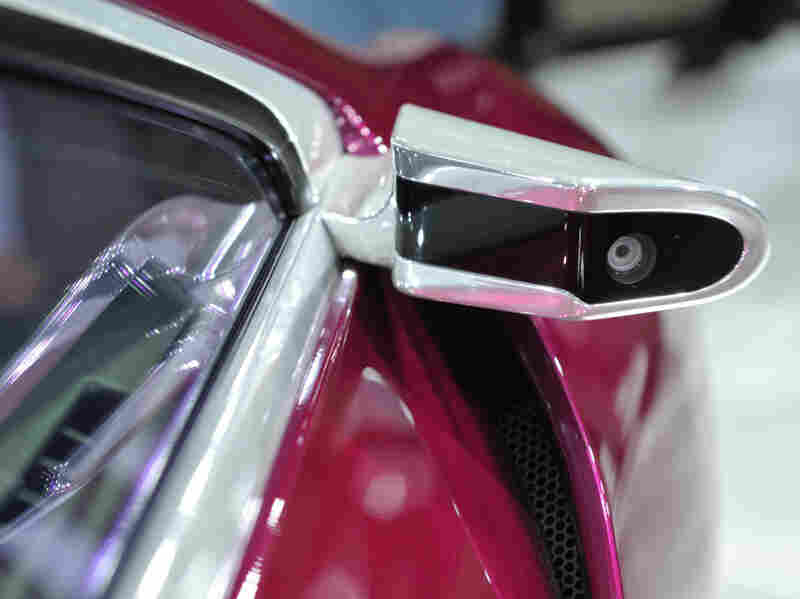 According to the car research site Edmunds.com, nearly half of 2012 model cars already come with rearview cameras as standard equipment. The Auto Alliance's Newton cites recent mandates to make cars more fuel efficient and to reduce greenhouse gas emissions. "There's no doubt that autos are a tremendously heavily regulated product," he said. "In the last decade, automakers have seen four rule-makings that will create costs of about $55.5 billion. So there clearly is an impact on the industry." But safety can also be a selling point. Bruce Belzowski of the University of Michigan's Transportation Research Institute says some manufacturers believe it can give them an edge in the market. "For example, you look at in the ... probably mid-1990s, Lee Iacocca at Chrysler said, 'You know, I think that safety is going to sell. We're going to put dual air bags in all our vehicles.' And it turned out to be a big seller for them, and it forced all of the other manufacturers to follow suit pretty quickly," he said. The government estimates that rearview cameras could drive up the cost of a new car by as much as $200. LaHood says he expects that new rear-visibility regulation will be issued by the end of the year. Previous versions of this story said that the auto industry sought the delay in requiring new cars to have backup cameras. The story has been corrected to indicate that industry says it did not seek the delay, but a spokesman says the industry wants the government to consider alternatives to backup cameras.